A legal loophole that allows minibus drivers to operate without undergoing a criminal record check is putting passengers in danger, councils say. Drivers of "public carriage vehicles", which seat 9-16 people, are not subject to a criminal check - unlike hackney carriage and private taxi drivers. This allowed "unscrupulous drivers" to work even if councils have banned them, the Local Government Association said. A Department for Transport spokesman said it was planning immediate action. Under the current rules, drivers of public carriage vehicles are licensed by the DVLA, whereas councils license taxi drivers. 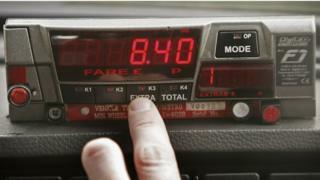 Taxi drivers require an up-to-date enhanced criminal record check to be issued with a licence. The LGA said a loophole meant drivers who have been refused a taxi or minicab licence - or whose licence has been revoked by councils - could instead obtain a minibus licence and continue to operate in the same area. Some had continued working with the same company, the LGA added. It urged the government to change the law to ensure vehicles seating nine to 16 people were instead licensed by councils. Simon Blackburn, from the LGA, said the majority of minibus drivers were "people who the public can trust". However, he added: "This loophole provides an opportunity for unscrupulous drivers to continue to work in close proximity to passengers, even when a council has determined that they are not safe to do so. "Larger minibuses are often sent in place of a regular taxi to pick up individuals or small parties, purely because they are nearest to the pick-up point rather than because there is a requirement for such a large vehicle. "They are used to take groups of children to school, or to drive groups home after nights out. "It is therefore extremely worrying that councils' proactive work to protect taxi passengers from harm - and particularly those who may be most vulnerable - is being undermined by this loophole." A Department for Transport spokesman said public safety remained "our first priority". It said: "It is the responsibility of councils to meet their legal requirements to ensure all drivers are 'fit and proper' persons before issuing a taxi or private hire driver's licence. "We are taking immediate action to provide the same level of protection for passengers in minibuses as they receive in taxis."